Sprayed using a stencil on a couple of pieces of board, this sign utlises the Hilton Hotels logo (below) as inspiration. The name is indicative of many similar names that are reflective of the physical environment students find themselves living in. Some names clearly point out the deficits of these homes while others bestow lofty or ironic names on the flats that contrast starkly with the poor state of the building. Being a prestigious international hotel chain, clearly this flat can not compare, the use of the name and logo is ironic. 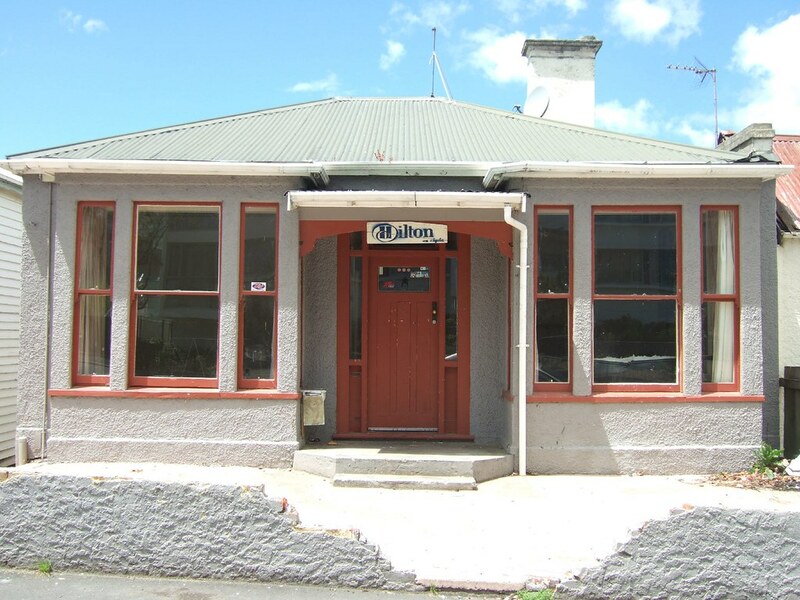 Hilton logo – this image is reproduced under fair use terms as part of the discussion about named flats in Dunedin, specifically to compare the company logo with a named student flat using that logo. Later iterations of the Hilton sign (2008) include one that utlises a single bedhead as the basis of the sign but the Hilton logo is no longer evoked. The house features in Villa by Patrick Reynolds and Jeremy Salmon (2012). 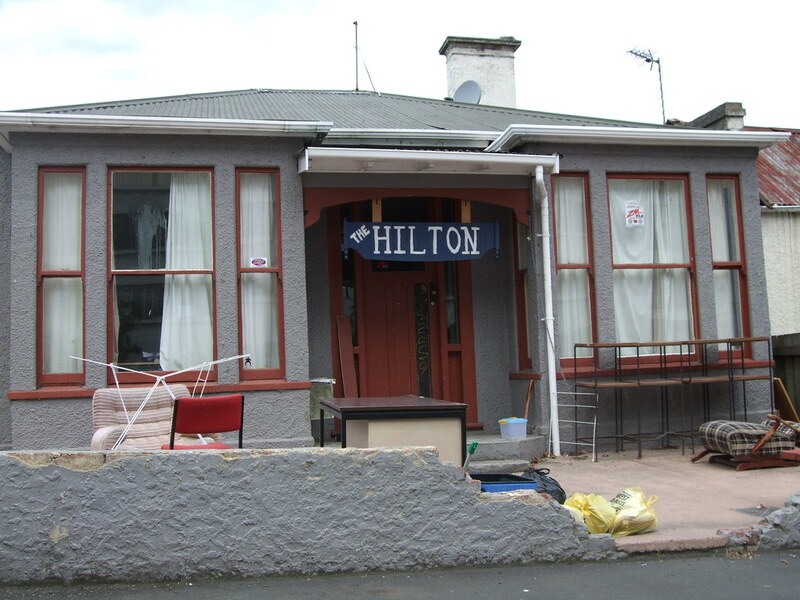 The Hilton features in “Ghetto flats in Dunedin” by Justin Hawkes (2003). He directed this for a New Zealand TV Show ‘Space’. Used to be called Narnia until 2000. We moved in 2001 and pulled the Narnia sign down, and was unnamed for most the year. Flatmate had some mates in the undie500 from chch come down, and when they were leaving we were joking about how much of a sh*t-hole the flat was (but an aweomse one spray painted ‘Hilton on Hyde’ on that half-pulled down brick fence at the front – a classic name inspired on the spot. Used to be called Narnia until 2000. We moved in 2001 and pulled the Narnia sign down, and was unnamed for most the year. Flatmate had some mates in the undie500 from chch come down, and when they were leaving we were joking about how much of a sh*t-hole the flat was (but an awesome flat nonetheless), and one spray painted ‘Hilton on Hyde’ on that half-pulled down brick fence at the front – a classic name inspired on the spot. Thanks Ben, great to know where the name began. Do you have a photo of the spray painted sign?